Joe O’Connor is a solar manufacturing entrepreneur as well as a consultant, speaker, and writer on solar energy. He has built off grid solar energy systems in the U.S., Haiti, Nepal, Portugal, Guatemala, and most recently in Virunga National Park, Democratic Republic of the Congo. To learn more about his work in the Congo, click here to read SolarCity, Tesla, and Virunga: Building Solar Micro Grids for the guardians of Africa’s oldest and most biodiverse national park. Seeking to amplify his impact after over a decade of traveling to remote places to install solar, Joe decided to share his knowledge and experience of off-grid solar energy systems by writing this book. He is currently a Senior Applications Engineer for Energy Storage at Mercedes-Benz Energy. In his previous position at SolarCity, he supported the Micro Grid Team and the GivePower Foundation by designing solar photovoltaic and Tesla Powerwall systems. He also prototyped, designed, and patented a new solar racking system that enabled SolarCity to become one of the largest commercial installers in the U.S. Prior to his work at SolarCity, Joe launched a cost-efficient solar racking product at solar manufacturing start-up, Sollega. He has also worked with Sustainable Energy Partners in San Francisco, completing dozens of renewable energy and energy efficiency projects. Joe earned his M.S. from NYU Polytechnic University in Manufacturing Engineering and was selected as a recipient of the Catherine B. Reynolds Foundation Fellowship for Social Entrepreneurship. He earned his B.S. from Cal Poly University in Industrial Technology. Alternatives—the Habitat for Humanities of the solar industry—when he teamed up with other volunteers to install solar electric systems on homes of low-income families in the San Francisco Bay Area. Joe believes that advancements in the renewable energy industry will help our global society break its dependency on oil, coal, and natural gas. He is on a mission to make renewable energy the dominant energy source on our planet. 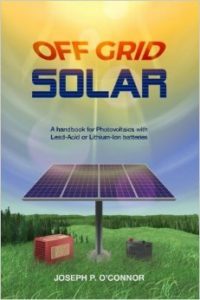 This entry was posted in Energy Storage, Installation, NewsBlog, Solar Energy Education and tagged Joseph P. O'Connor, Nebraskans for Solar, Off Grid Solar, solar energy storage, solar for do-it-yourselfers on December 25, 2016 by Helen Deffenbacher.